Walters: When Is a Vacancy Not a Vacancy? 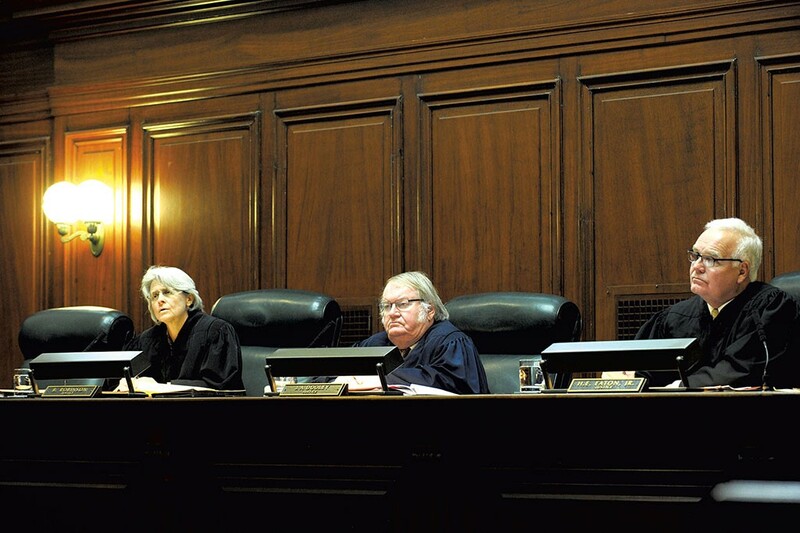 Left to right: Justices Beth Robinson, John Dooley and Harold Eaton Jr.
On Tuesday afternoon, the Vermont Supreme Court will consider a case involving itself and the implications of the word “vacancy.” And the very person who has triggered the case will sit in judgment upon it. That person is Supreme Court Justice John Dooley. In September, he declined to seek reappointment to the bench, and his term ends in March. After he announced his pending retirement, outgoing Democratic Gov. Peter Shumlin declared his intention to appoint Dooley’s successor. Since then, House Minority Leader Don Turner (R-Milton) challenged Shumlin’s authority to fill a vacancy that won’t actually exist until after Shumlin leaves office. Turner’s argument rests on the Vermont Constitution’s employment of the word “vacancy,” which would be a dangerous trigger word for a drinking game during Tuesday’s hearing. Appealing to common sense, he asserts that there can’t be a vacancy until the seat is actually, you know, vacant. For his part, the governor appeals to state law, which seems to grant him authority to replace a member of the judiciary as soon as the vacancy is inevitable. He argues that this is already the case, since the statutory deadline for Dooley to seek reappointment has come and gone. When you read the arguments on one side, they seem to make sense. As do the arguments on the other side. At the same time, thinking too closely about this case runs the risk of opening a linguistic black hole beneath your feet. This is the kind of thing that ensures full employment for members of the bar. Sears entered the fray at the last minute, filing his brief just before the court’s deadline on the afternoon of December 30. On December 28, Sen. Joe Benning (R-Caledonia) had joined the suit in support of Turner. Benning’s entry was sparked by concern that the court could throw out the case on procedural grounds — i.e., that Turner lacks “standing” to bring the case. Since the state Senate must approve judicial appointments, Benning’s case for standing is more direct than Turner’s. Sears offers a differing view from within the ranks of the Senate and, as a longtime senator and chair of the Senate Judiciary Committee, his view of the constitution and the law carries weight. And what of governor-elect Phil Scott? It could be argued that he has the clearest possible claim to “standing,” since he would fill the vacancy if Shumlin does not. But Scott has stayed on the sidelines because he didn’t want to inject politics into the process at a time when a partisan controversy was raging over a vacancy on the U.S. Supreme Court. Even so, Scott told Seven Days before his election that he’d hoped Shumlin would pass the vacancy on to his successor — whether it was Scott or his rival, Democrat Sue Minter. Both sides claim to be in the right, but neither has a clear precedent to offer. This precise situation — a judicial retirement announced before an election that will take effect after a new governor is inaugurated — has apparently never happened in Vermont history. Sears’ brief cites two cases in which a judge announced his retirement and a successor was named before the judge stepped down. But in neither case was a change in governorship involved.